Governor-Elect Gina Raimondo announced her plan Tuesday to nominate Stefan Pryor for Rhode Island’s newly created Secretary of Commerce post. The outgoing Education Commissioner in Connecticut, Pryor chose not to seek a second term, a move political observers saw as evidence he had become a liability for Democratic Governor Dannel Malloy, who faced a close battle for re-election. If anyone had the slightest doubt about the depth of Raimondo's connections to the Connecticut school reform keiretsu, it should be now dispelled. This is wingnut welfare for Democats. As far as I can tell, and I've looked, nobody in ed reform is working from a set of formal, rigorous definitions of "curriculum," "standards," "outcomes," or "competencies" sufficient to distinguish between these things consistently. As in "X is an outcome but NOT a competency/standard/outcome/curriculum because it meets criteria A, B and C and fails to meet criteria D."
I'm not even saying there are competing models. There don't seem to be any models at all. I don't see any reason to think outcomes-based, standards-based, and competency-based systems have not been a 25 year continuous project with slight re-branding. I believe that we learn by practice. Whether it means to learn to dance by practicing dancing, or to learn to live by practicing living, the principles are the same. In each, it is the performance of a dedicated, precise set of acts, physical or intellectual, from which come shape of achievement, the sense of one’s being, the satisfaction of spirit. One becomes in some area an athlete of God. Practice means to perform over and over again, in the face of all obstacles, some act of vision, of faith, of desire. Practice is a means of inviting the perfection desired. How does the idea of practice unfold in Martha Graham’s “An Athlete of God”? The first paragraph, and the text as a whole, sounds pretty good the first couple times through, especially if you approach it as the work of a Great American Genius. But really, it is kind of a mess. It is a short, popular text, penned to be read aloud once, written by someone not known for writing such things. Graham's piece never resolves the basic question of whether "practice" is something undertaken by only an elite through specific actions, by everyone just by living, or some combination of those. If we learn by practice do we not learn by not practicing? If we practice nothing do we learn nothing? Can we not learn by something we experience once? The more you dig into the text, the less it makes sense and hangs together. It does not address that when she says "dance" she really only means a very specific kind of dance, probably. She says dance holds an "ageless magic for the world," but that's highly contingent on context. She ends by praising the smile of the acrobat, but the acrobat smiles because it is his job. He is not an artist, he is an entertainer. To closely read this text you have to conclude Martha Graham knows or cares little about the world outside of dance. It wasn't meant to be re-read and doesn't stand up to it. Coleman seems uncertain as well about Graham's meaning and ultimately states, "The mystery of what Graham means can be illuminated only by further reading," which could be translated as "finding a better text on the subject." But then again, what is the subject? Why would one read this in the first place? Where would it fit into the curriculum other than as a moral exemplar of hard work and grit? 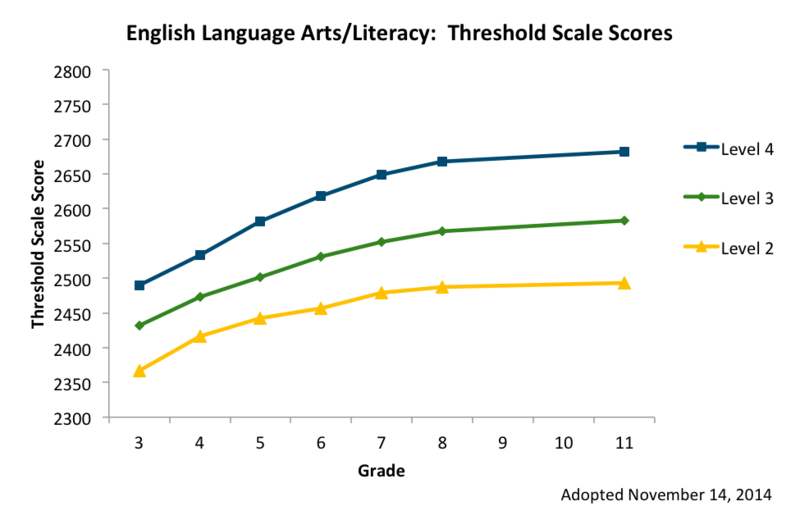 Does Smarter Balanced Think 15% of 5th Graders are "College and Career Ready" in English? I'm working on a longer piece trying to decipher what Common Core and Smarter Balanced are saying about growth in ELA/Literacy after 8th grade. Specifically, Smarter Balanced (one of the two big Common Core testing consortia) recently released their achievement level recommendations for grades 3-11. This is particularly noteworthy because the achievement levels are on a continuous vertical scale. That is, all grades are scored on the same scale. As I understand it, these scores should be comparable across grades. That is, if a 4th grader gets a 2560 and an 11th grader gets a 2560, they are at the same level as far as Smarter Balanced and their interpretation of the Common Core are concerned. Notice how the expected/required growth levels off after 8th grade, when there is a two year gap in testing (apparently?). Essentially the same amount of growth is expected in grades 9, 10, and 11 as in 8th, and considerably less than the elementary grades. And notice how the cut score for a "4" in 5th grade is virtually the same as a passing "3" in 11th grade. Smarter Balanced thinks 15% of 5th graders will achieve this level. 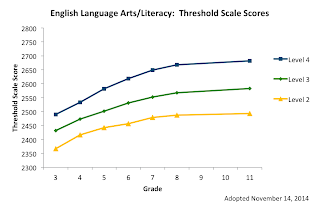 Thus, consulting their estimated percentage of students at each achievement level graphs, we see that Smarter Balanced thinks that 15% of 5th graders will be college ready in ELA/Literacy, and 41% of 11th graders will be. The 5th grade rate of actual college readiness as 10 year olds, not just being on track for it eventually, is over a third of the 11th grade total. I noticed a while ago that the 8th grade standards were extremely close to the "college and career readiness" anchor standards, and wondered how it would play out over time. Turns out they're sticking to that idea. At the end of the day, these "rigorous" standards think you're pretty much set with your learning in ELA/Literacy if you're meeting the 8th grade standard. You've got a little to learn about reading, writing and literature the next four years, but not much. I... just don't get it. The harm is that "rigor" is being pushed down to the lowest grade levels, but for not much benefit in high school. Am I missing something here?